How much does a survey it cost and how is it priced? Surveying is a professional service, and as such, is not something that is simply "picked off a shelf". The cost of a survey reflects the time and expertise provided by the surveyor. A survey for which the scope can be well defined may be provided for a fixed fee, which is, in turn, based on the anticipated time required for the project. More often, the precise scope of a project cannot be determined until work has commenced and detailed information is gathered. Services for these projects are typically provided on an hourly basis, based on a proposal/work agreement that will outline the expected scope, and an estimated cost, but which indicates that actual billing will be based on time and expenses. Hourly rates vary to reflect the costs of equipment used and level of expertise required for a given task, but typically range from around $30-40/hour for administrative tasks or travel time through around $100/hour for a full field crew with equipment. Certain services such as those utilizing specialized equipment or expert court testimony will be billed at a higher rate, or sometimes per diem. Though the rates may appear somewhat high, they are set to cover the cost and depreciation of equipment, and other overhead costs such as insurance, professional development education, licensing fees, professional association memberships, software upgrades and licensing, reference materials and many hours of time that aren't directly related or billed to a specific project, but are necessary to work efficiently on all projects. Though it can seem expensive, a typical Boundary Survey prepared to the standards required for filing with the County Registry of Deeds usually costs a smaller percentage of the value of your property than the percentage of the cost of new tires compared to the value of your car. An important factor to keep in mind regarding the hourly rates charged is the efficiency with which the work can be performed. Some surveying firms, especially larger companies, utilize field crews and other personel with limited experience, that are overseen "from afar" by the responsible surveyor - yet the rates charged are comparable to those listed above. At Cardigan Mountain Land Surveys, every phase of every survey is always performed directly by the licensed surveyor with over 25 years of experience, so you can be sure you're getting the best value for your dollar. Even more important than the cost is the correctness and ultimate defensibility of a survey. Deficiencies in a survey are usually not caused by imprecise measurements, but rather from incomplete records research, missed, or misinterpreted boundary evidence in the field or faulty interpretation of data, and are not usually apparent on the face of a survey plan. Yet when they are discovered, such as when a neighboring property is surveyed, the results can be potentially disastrous - for both landowners. A classic example culled from the files: A boundary is shown on an existing recorded survey as long straight line, and marked accordingly by a line of marked blazed trees. Upon undertaking a resurvey of the line, it is found that although the current deed description of the land is as a single parcel, thorough deed research indicates that there were historically two properties that met at a corner about halfway down the line, and marked by a stone pile. Upon making a diligent search, the stone pile is found - mostly buried, but unmistakable once uncovered - and about 40 feet off of the straight line. Luckily in this case there were no buildings or substantial site improvements affected, but had there been, litigation would have been the likely result. So it is important when choosing a surveying firm to do your homework and ensure that the company has a good track record and reputation of providing thoroughly prepared and defensible surveys. When obtaining proposals, be sure that the description of services is complete. If you find one cost estimate to be substantially less than others, beware - it may reflect shortcuts that could cost you far more in the long run! Is the lot part of a recent subdivision with an accurate existing survey, or created by old, even ancient “piecemeal” property conveyances? 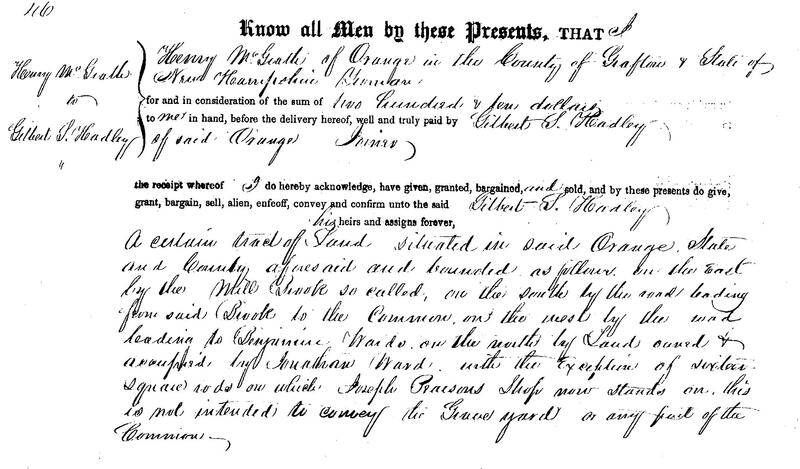 Even today, the written record descriptions of some properties date to the 1700's! Is the description of a boundary in your deed the same as in your neighbor's deed? Do corner markers exist? Are they original and undisturbed, and are they consistent with deed descriptions? If missing, is there precise survey data documenting their location? Is the property in the vicinity of an old mill site? Along the railroad? An ancient farm passed down through generations without description? Are the deed descriptions precise (e.g. “thence N45°16’34”W 165.74’ to a drill hole in a stone wall corner…”) or vague (e.g. “bounded northerly by the Jones farm…”)? Is the property open field? Mature forest? Recently logged and covered with slash, brambles and sapling growth? Quicksand and swamps? For a subdivision, what are the Planning Board and Zoning requirements? It is because there can be so many factors, many of which cannot be determined in advance, that a survey proposal will more often provide a cost estimate with final billing based on the actual time and expenses required to complete the survey. With long experience, knowledge of a given area and review of readily available information, the cost can almost always be estimated within a few percent of what the actual billing turns out to be.